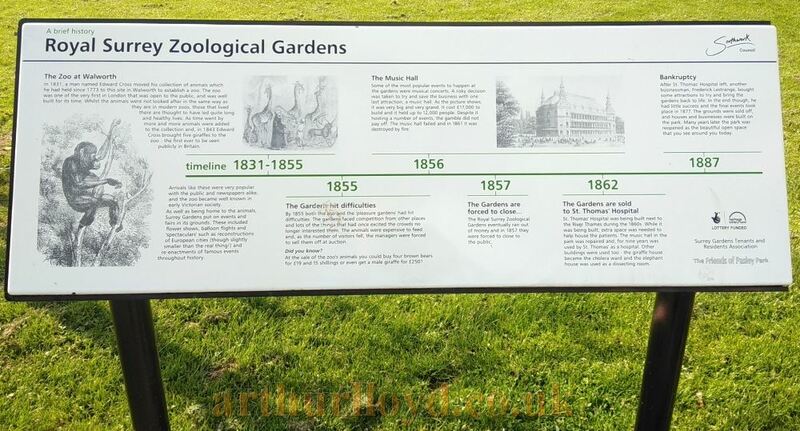 Above - An information board detailing the history of the Royal Surrey Zoological Gardens situated in the present day Pasley Park in Walworth, Southwark, which is on part of the site of the former the Royal Surrey Zoological Gardens - Courtesy Philip Paine, April 2019. On the east side of Kennington Park Road, near the junction of that thoroughfare with Kennington Lane and Newington Butts, is Penton Place, through which was one of the approaches to the Surrey Gardens, formerly known as the Surrey Zoological Gardens. "When Exeter Change ceased to exist, the then proprietor, Mr. Edward Cross, removed his menagerie to the King's Mews at Charing Cross, and soon after obtained Possession of the grounds formerly attached to the 'Manor House' at Walworth. The grounds comprised in all about fifteen acres, which were utilised to their fullest extent, exclusive of a sheet of water covering nearly three acres more. Left - The Music Hall, Surrey Gardens, 1858. The gardens were approached from Manor Place, Walworth, and there was a second entrance from Penton Place,Kennington Road. The large conservatory, three hundred feet in circumference, and contaning upwards of 6,000 feet of glass, was at that time the largest building of its kind in England. This was afterwards used to enclose the cages of the lions, tigers, and other carnivora. In the year 1834 was exhibited here a one horned Indian rhinoceros, for which Cross paid £800; two years later three giraffes were added to his collection. The first picture was 'Mount Vesuvius,' painted by Danson, in 1837, the lake representing the Bay of Naples, and a display of fireworks serving vividly to illustrate the eruption, which was nightly repeated in the presence of admiring crowds, and served as the chief attraction of the place for upwards of two years. Then followed, in 1839, a representation of 'Iceland. and Mount Hecla;' in 1841, the 'City of Rome,' which occupied five acres, and was painted on surface upwards Of 250,000 feet square; in 1843 the 'Temple of Ellora;' in 1844, 'London during the Great Fire of 1666;' in 1845, the 'City of, Edinburgh.' 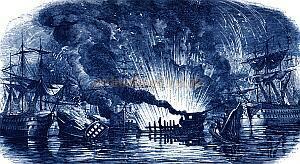 In 1846 'Vesuvius' was reproduced; in 1848 there was a revival of 'Rome ;' in 1849 there was the 'Storming of Badajoz,' with new effects of real ordnance.' In this same year M. Jullien organised a series of promenade concerts on four evenings in each week, the admission remaining fixed, as before, at a shilling. The fireworks were always a great attraction of the gardens. In 1850 was exhibited 'Napoleon's Passage over the Alps ;' in this picture were represented some fifty thousand men in motion, who, in the front, appeared of life-size, and who, in fact, were living men, but who were made, by an optical illusion, to dwindle gradually at different distances to the veriest specks which the eye could track along the zigzag line of ascent towards the summit of the Alpine Pass, where stood the monastery of St. Bernard ready to receive the weary and half-frozen troops and their imperial master. On the death of' Mr. Cross the proprietorship and management of the gardens devolved on his secretary and assistant, a man named Tyler, who conducted them for some years, when the property became vested in a Limited Liability Company. 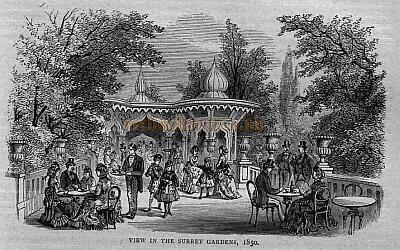 In 1856 the gardens were put up to auction and the Surrey Music Hall was erected upon a portion of the grounds. The gardens were used in 1856 for the purpose of entertaining the Guards with a public dinner after their return from the Crimea; and again, in 1862, they were re-opened with a picture of the 'City and Bay of Naples,' showing Vesuvius in the distance. But the fitful taste of the public did not care for' the revival; and though a of fresh amusements in succession was announced, and provided, yet it was found that the place had lost its popularity to a degree which was irretrievable, and accordingly the gardens were closed. The grounds were afterwards more advantageously occupied, as the temporary Hospital of St. Thomas, before its removal to Lambeth Walk." The principal walks and avenues were planted with every description of native and exotic forest trees that would endure the climate; whilst the beautiful sheet of water, mentioned above, was spotted with islands, shrubberies, and plantations of great richness. Right - View in the Surrey Gardens, 1850. The London Zoological Society has certainly the merit of taking the lead in this description of garden; but Mr. Cross has not only proceeded more rapidly than they have done, but has erected more suitable and more imposing structures than are yet to be found in the gardens in the Regent's Park. What is there, for example, in the latter garden which can be at all compared with the circular glass building 300 feet in diameter, combining a series of examples of tropical quadrupeds and birds, and of exotic plants? In the plan of this building the animals (lions, tigers, leopards, &c.) are kept in separate cages or compartments towards the centre; exterior to them is a colonnade, supporting the glazed roof, and also for cages of birds; within this colonnade will be placed hot-water pipes for heating the whole, and beyond it is an open paved area for spectators; next, there is a channel for a stream of water, intended for gold, silver, and other exotic fishes; and, beyond, a border, under the front wall, for climbing plants to be trained on wires under the roof." The grounds were laid out under the supenintendence of Mr. Henry Phillips, the author of "Sylva Florifera," and it is almost impossible to give the reader an idea of their beauty and variety. 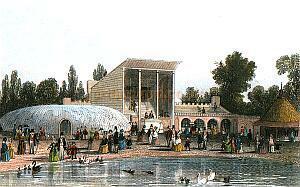 Besides the large glass building mentioned above, there were several movable aviaries and cages for the feathered tribes; whilst one of the prettiest spots was the "beaver-dam," a small pond partly enclosed by rockwork, Altogether, at one time these gardens offered a great rival attraction to those at the Regent's Park, which we have already described. Left - The Fountain in the Surrey Garden. In 1834 a live female gorilla was added to this menagerie, and proved a great favourite of the Visitors. The collection here was not so extensive as that in the Regent's Park, but some of the animals were much finer, particularly one of the lions. A story-we fear rather apocryphal-is told of one of the lions here in the early part of their existence. A small black spaniel being thrown into his cage, instead of killing and eating it, the king of beasts took it under his protection, fondled it, and played with it; and when it died, the lion was so deeply grieved that he survived the loss of his companion only a few days! 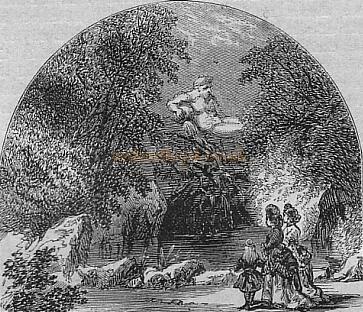 The volcanic exhibitions at the Surrey Zoological Gardens probably had their origin in the Ranelagh spectacles of the last century; for in 1792 was shown in the latter gardens a beautiful representation of Mount Etna, with the flowing of the lava down. its sides. The height of the boarded work which represented the mountain was about eighty feet, and the whole exhibited a curious specimen of machinery and pyrotechnics. Of the Surrey Gardens, as they existed in the year of grace 1850, Mr. H. Mayhew wrote, Mount Etna, the fashionable volcano of the season, -just now is vomiting here its sky-rockets and Roman candles." During the last few years of their existence, these gardens added the attractions of music. A large covered orchestra, capable of accommodating a large number of performers, was fitted up on the margin of the lake, for the purpose of giving open air concerts on a gigantic scale; and this was retained during the summer months by Jullien's band. 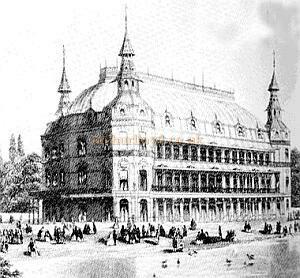 Jullien led the orchestra at the concerts here in 1851, the year of the Great Exhibition. Left - The Surrey Zoological Gardens in 1851 - Richardson J. London and Its People, 1995. The Surrey Music Hall, mentioned above a large oblong building-is admirably adapted for the purposes for which it was built. At each corner are octagonal towers containing staircases, originally crowned by ornamental turrets. An arcade surrounds the ground-floor, whilst to the first and second floors are external galleries covered by verandas. The great -hall, which holds 12,000 persons, exclusive of the orchestra, cost upwards of £18,000. It is twenty feet longer and thirty feet wider than the Great Room at Exeter Hall. On Sundays it was used temporarily, as we have seen, for the religious services held by the late Mr. Spurgeon, on his first rush into popularity; and on the first occasion of holding these services -the evening of October 19, 1856-it was the scene of a serious and fatal accident, seven persons being killed by a false alarm of fire raised by some reckless and wanton jesters. We have already spoken of Mr. Spurgeon in our account of the Metropolitan Tabernacle, but we may further, remark here that, notwithstanding the above-mentioned occurrence, large numbers, continued for the space of three years to hear Mr. Spurgeon on Sunday mornings. A letter, signed "Habitans in Sicco," and dated from Broad Phylactery, Westminster," appeared at this period in the Times; part of it ran as follows :--" 'I want to hear Spurgeon; let us go.' Now, I am supposed to be a High Churchman, so I answered, 'What! go and hear a Calvinist-a Baptist! a man who ought to be ashamed of himself for being so near the Church, and yet not within its pale?' 'Never mind; come and hear him. Well, we went yesterday morning to the Music Hall, in the Surrey Gardens . . . . . Fancy a congregation consisting of 10,000 souls, streaming into the hall, mounting the galleries, humming, buzzing, and swarming-a mighty hive of bees-eager to secure at first the best plates, and, at last, any place at all. After waiting more than half an hour-for if you wish to have a seat you must be there at least that space of time in advance .. Mr. Spurgeon ascended his tribune. To the hum, and rush, and trampling of men, succeeded a low, concentrated thrill and murmur, of' devotion, which seemed to run at once, like an electric current, through the breast of every one present, and by this magnetic chain the preacher held us fast bound for about two hours. It is not my purpose to give a summary of his discourse. It is enough to say of his voice, that its power and volume are sufficient to reach every one in that vast assembly; of his language that it is neither high-flown nor homely; of his style, that it is at times familiar, at times declamatory, but always happy, and often eloquent; of his doctrine, that neither the 'Calvinist' nor the ' Baptist' appears in the forefront of the battle which is waged by Mr. Spurgeon with relentless animosity, and with Gospel weapons, against irreligion, cant, hypocrisy, pride, and those secret bosom-sins which so easily beset a man in daily life; and to sum up all in a word, it is enough to, say of the man himself, that he impresses you with a perfect conviction of his sincerity. Right - One of the 'Pictures' as they were called at the Surrey Zoological Gardens. Illustrated London News, 1847. But I have not written so much about my children's want of spiritual food when they listened to the mumbling of the Archbishop of -, and my own banquet at -the Surrey Gardens without a desire to draw a practical conclusion from these two stories, and to point them by a moral . 'Here is a man not more Calvinistic than many an incumbent of the Established Church who 'humbles and mumbles.' as old Latimer says, over his liturgy and text--here is a man who says the complete immersion, or some of the kind, of adults, is necessary to baptism. These are his faults of doctrine; but if I were the examining chaplain of the Archbishop of -, I would say, ' May it please your grace, here is a man able to preach , eloquently; able -to fill the largest church in England with his voice, and, 'what is more to the purpose, with people. And may it please your grace, here are two churches in The metropolis, St. Paul's and Westminster Abbey. What does your grace think of inviting Mr. Spurgeon this heretical Calvinist and Baptist, who is able to draw 10,000 souls after him, just to try his voice some Sunday morning, in the nave of either of those churches?'" 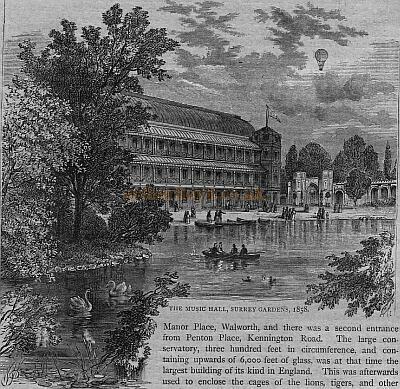 In June, 1861, shortly after being vacated by Spurgeon, the Music Hall was destroyed by fire. It was however rebuilt, and for a time was occupied as a temporary hospital during the erection of the St. Thomas's building near Westminster Bridge. 'The Gardens have now been built over, but a Memorial Hall marks the site. Left - The Music Hall in the Surrey Gardens. The old Manor House of Walworth is kept in remembrance by Manor Grove and Manor Place, the last-named thoroughfare uniting Penton Place with Walworth Road. Running out of the Walworth Road on the other side is York Street, where is an Independent chapel which has become the headquarters of a Settlement known as the Robert Browning Hall this name having been chosen for it from the fact that the poet was baptized in the chapel. The hall is the centre of a many-sided work in a district which has abundant need of the activities of the social reformer. A notable advance has been made in the way of buildings in this neighbourhood, particularly on the east side of the Walworth Road. - Lock's Fields, formerly a dreary swamp, and Walworth Common, which was at one time an open field, have been covered with houses. In Paragon Row the Fishmongers' Company have erected several model dwellings, with the aim of benefiting a very poor locality. The dwellings have been built on the "flat" system, realising as nearly as possible the idea of the cottage character, and replacing old and dilapidated houses of an inferior class. 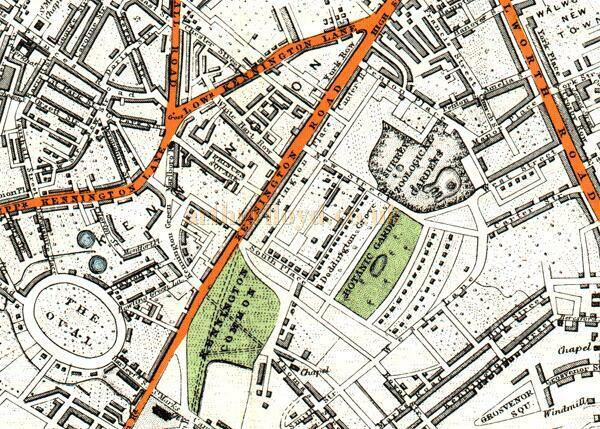 Whatever this locality may be in the present day, it has not been without its places, of amusement in former times, for we learn from Colburn's "Kalendar of Amusements" for 1840, that the Marylebone and Oxford cricket clubs played a match in that year at the "Beehive" grounds, Walworth. In 1823 the first stone of St Peter's Church, Walworth, was laid by the Archbishop of Canterbury, immediately after the performance of the like ceremony at Trinity Church, in this parish. The church, which is situated at a short distance on the eastern side of the Walworth Road, is built of brick, with the exception of the steeple and architectural ornaments, which are constructed of stone. The churchyard was converted into a 'recreation ground in 1896. St. John's Church, which stands a short distance backward on the eastern side of the Walworth Road, near York Street, is a lofty and handsome ,Gothic building, in the Decorated style, and was erected in 1865, at a cost of upwards Of £5,000. It was endowed by the Dean and Chapter of Canterbury, who are the patrons. Walworth is not entirely devoid of historical memorabilia if tradition is to be trusted; a native of this village for such it must have been in his day was William Walworth, the celebrated Lord Mayor of London who slew Wat Tyler with his own hand. It is not the fact, however, that the dagger in the arms of the City commemorates this deed. The above text was firts published in 'Old And New London' 1897. ...After 1855 and still more after 1870, building regulations in London actively discouraged the use of exposed-iron construction. Fire hazards, and the dangers of oxidisation and fragmentation, inhibited easy acceptance of the new material. By the 1870s not only had the search for an iron architecture been abandoned, a series of spectacular failures -- at the Surrey Music Hall, for example - had gone some way towards discrediting iron construction altogether. Steel was by then the material of the future. G. E. Street dismissed the search for a new, metallic architecture as "a wild goose chase." ...1856 Just three days after the great disaster at Surrey Gardens, Charles Haddon Spurgeon met with members of the press to announce he was taking a sabbatical from the pulpit for an indeterminate amount of time. Almost as soon as the young preacher began his ministry at New Park Street Chapel on London's south side, the Chapel became too small for the congregation. Though it could seat twelve hundred, seats, aisles, and even window-sills were overflowing whenever Spurgeon preached. A year after he arrived at New Park Street, the chapel was expanded, but the larger fifteen-hundred capacity building was still not sufficient for the thousands thronging to hear Spurgeon. For a time the congregation rented Exeter Hall, which seated forty-five hundred people, but it soon proved too small as well. Next, the elders leased the Surrey Music Hall in the Royal Surrey Gardens for services. This was London's largest, most commodious and most beautiful building, erected for public amusements, circuses, and carnivals. The hall held ten to twelve thousand people-and the building was packed to overflowing on Otober19 with nearly as many outside the building as were able to get in. Sadly, the service had only just begun when hooligans began shouting, "Fire! The galleries are giving away, the place is falling!" In the ensuing panic to flee the building, a number of people were trampled. Seven died and innumerable others were seriously injured. Spurgeon was tremendously depressed over the event, and his grief was so deep some feared his reason had left him. He spent hours "in tears by day, and dreams of terror by night." Within two weeks, however, Spurgeon had recovered sufficiently to preach again. The crowds were even bigger than before. Then, in the spring of 1861, the congregation's new home, the Metropolitan Tabernacle, was completed. This was to be Spurgeon's pulpit for the next thirty-one years. Throughout those years an average of five thousand people attended each morning and evening Sunday service. Though he constantly preached to a sea of faces, Spurgeon trembled at the multitudes who came to hear him-always mindful of the horror of the Surrey Garden disaster - Crosswalk.com. The burning down of the Surrey Hall in 1861 became the subject of a legal precedent. Taylor v Caldwell (1863) 3 B & S 328: 122 ER 309.